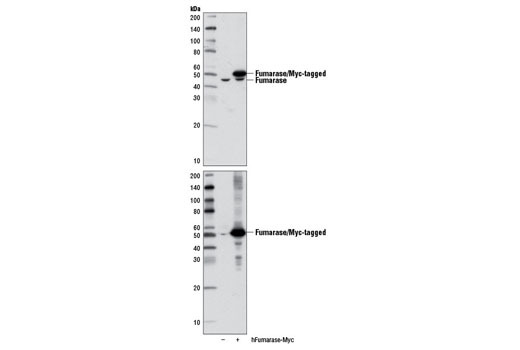 Western blot analysis of extracts from 293 cells, untransfected (-) or transfected with a Myc-tagged cDNA expression construct encoding human fumarase (hFumarase-Myc; +), using Fumarase (D9C5) Rabbit mAb (upper) and Myc-Tag (71D10) Rabbit mAb #2278 (lower). 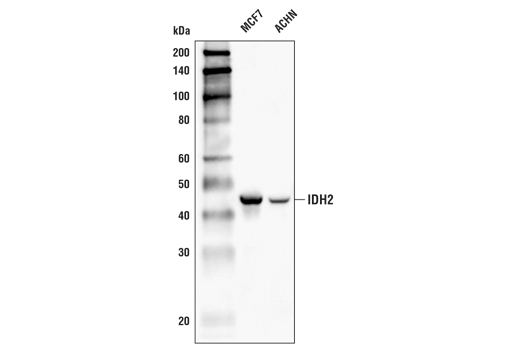 Western blot analysis of extracts from MCF7 and ACHN cells using IDH2 (D8E3B) Rabbit mAb. Western blot analysis of extracts from various cell lines using Citrate Synthase (D7V8B) Rabbit mAb. 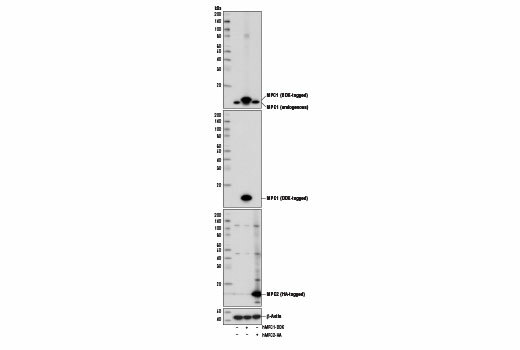 Western blot analysis of extracts from various cell lines using MPC2 (D4I7G) Rabbit mAb. 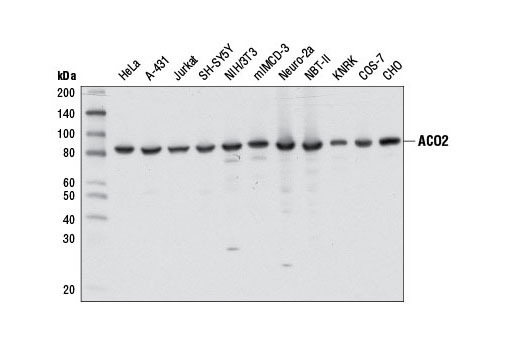 Western blot analysis of extracts from various cell lines using MPC1 (D2L9I) Rabbit mAb. 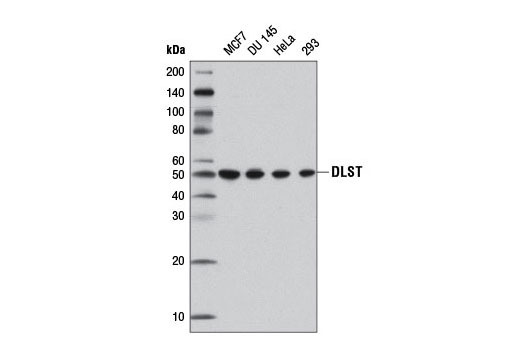 Western blot analysis of extracts from various cell lines using DLST (D22B1) XP® Rabbit mAb. 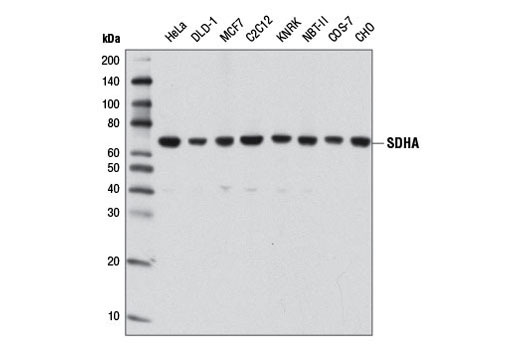 Western blot analysis of extracts from various cell lines using SDHA (D6J9M) XP® Rabbit mAb. 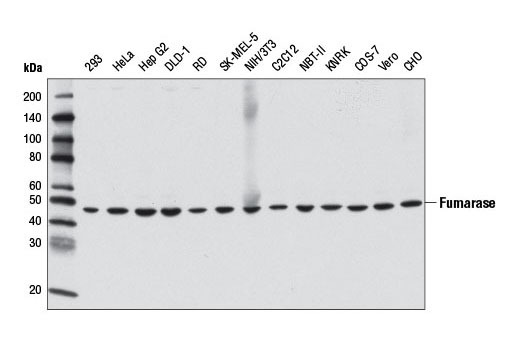 Western blot analysis of extracts from HepG2 and NIH/3T3 cells using IDH1 Antibody. 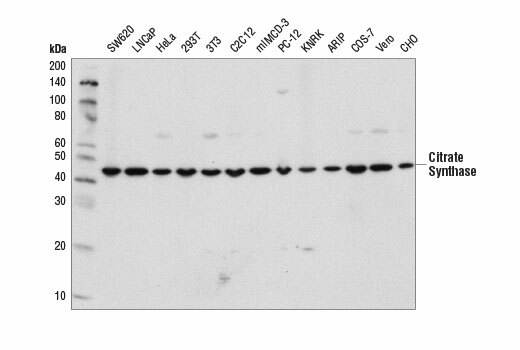 Western blot analysis of extracts from various cell lines using Fumarase (D9C5) Rabbit mAb. Immunoprecipitation of IDH2 from Hep G2 cell extracts. Lane 1 is 10% input, lane 2 is Rabbit (DA1E) mAb IgG XP® Isotype Control #3900, and lane 3 is IDH2 (D8E3B) Rabbit mAb. 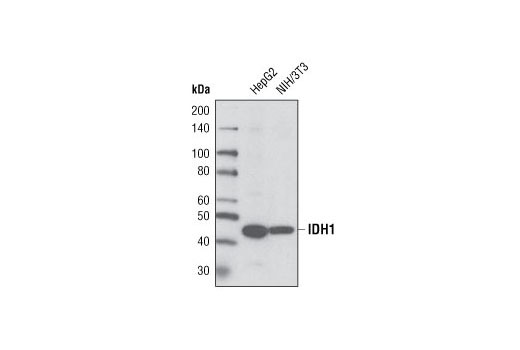 Western blot analysis was performed using IDH2 (D8E3B) Rabbit mAb. 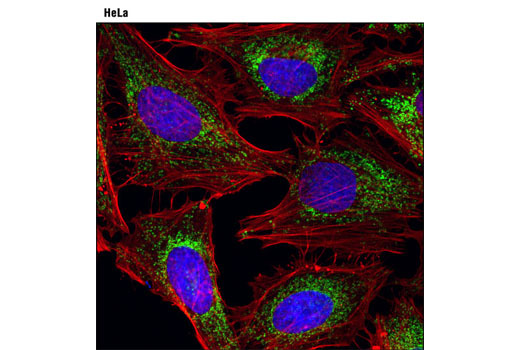 Confocal immunofluorescent analysis of HeLa cells using Citrate Synthase (D7V8B) Rabbit mAb (green). Actin filaments were labeled with DyLight™ 554 Phalloidin #13054. Blue pseudocolor = DRAQ5® #4084 (fluorescent DNA dye). Western blot analysis of extracts from 293 cells, mock transfected (-) or transfected with a construct expressing DDK-tagged full-length human MPC1 protein (hMPC1-DDK; +) or HA-tagged full-length human MPC2 protein (hMPC2-HA; +), using MPC1 (D2L9I) Rabbit mAb (upper), DYKDDDDK Tag (9A3) Mouse mAb #8146 (upper middle), HA-Tag (C29F4) Rabbit mAb #3724 (lower middle), and β-Actin (D6A8) Rabbit mAb #8457 (lower). Both expression vectors were provided by Dr. Jared Rutter's laboratory at the University of Utah School of Medicine. Immunoprecipitation of DLST from HeLa cell extracts using Rabbit (DA1E) mAb IgG XP® Isotype Control #3900 (lane 2) or DLST (D22B1) XP® Rabbit mAb (lane 3). Lane 1 is 10% input. 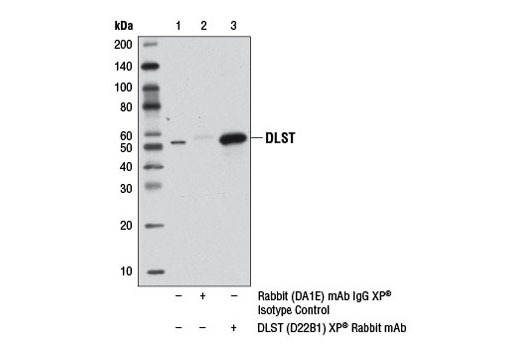 Western blot analysis was performed using DLST (D22B1) XP® Rabbit mAb. 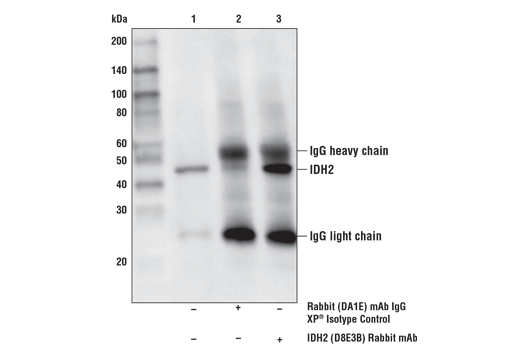 Mouse Anti-rabbit IgG (Light-Chain Specific) (L57A3) mAb #3677 and Anti-mouse IgG, HRP-linked Antibody #7076 were used as secondary antibodies. Immunoprecipitation of SDHA from HeLa cell extracts using Rabbit (DA1E) mAb IgG XP® Isotype Control #3900 (lane 2) or SDHA (D6J9M) XP® Rabbit mAb (lane 3). Lane 1 is 10% input. 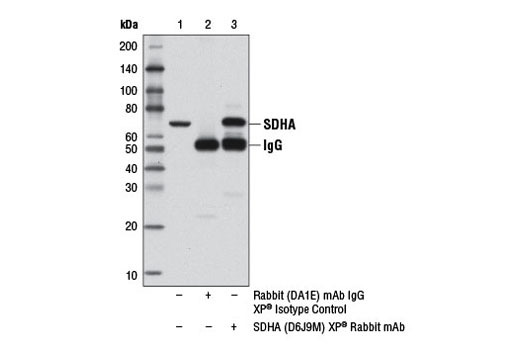 Western blot analysis was performed using SDHA (D6J9M) XP® Rabbit mAb. Immunoprecipitation of MPC1 from Huh7 cell extracts using Rabbit (DA1E) mAb IgG XP® Isotype Control #3900 (lane 2) or MPC1 (D2L9I) Rabbit mAb (lane 3). Lane 1 is 10% input. 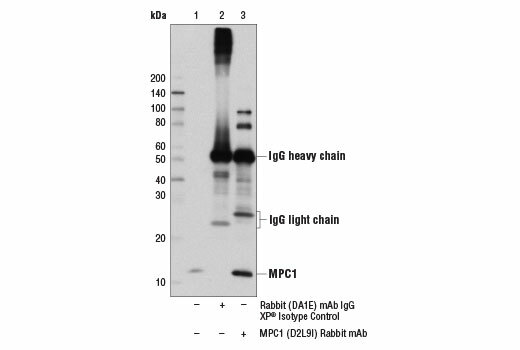 Western blot analysis was performed using MPC1 (D2L9I) Rabbit mAb. 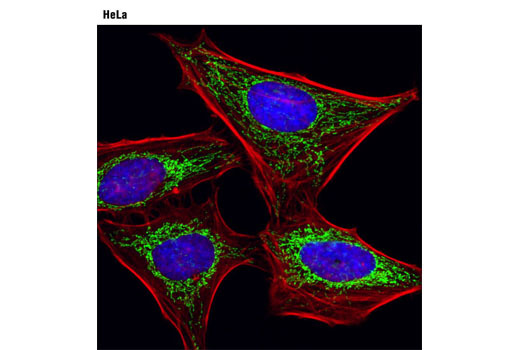 Confocal immunofluorescent analysis of HeLa cells using DLST (D22B1) XP® Rabbit mAb (green). Actin filaments were labeled with DY-554 phalloidin. Blue pseudocolor = DRAQ5® #4084 (fluorescent DNA dye). 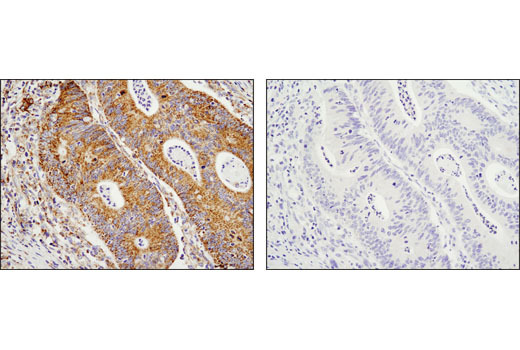 Immunohistochemical analysis of paraffin-embedded human colon carcinoma using SDHA (D6J9M) XP® Rabbit mAb in the presence of control peptide (left) or antigen-specific peptide (right). 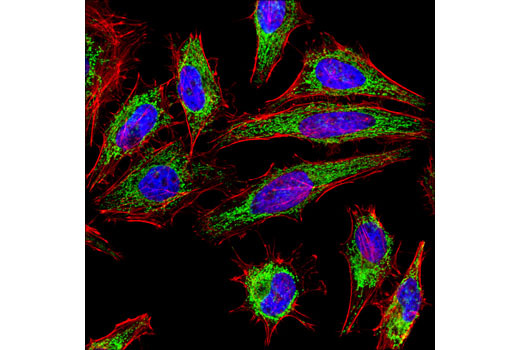 Confocal immunofluorescent analysis of HeLa cells using SDHA (D6J9M) XP® Rabbit mAb (green) and β-Actin (8H10D10) Mouse mAb #3700 (red). Blue pseudocolor = DRAQ5® #4084 (fluorescent DNA dye). The Tricarboxylic Acid Cycle Sampler Kit provides an economical means of detecting select components involved in tricarboxylic acid cycle. 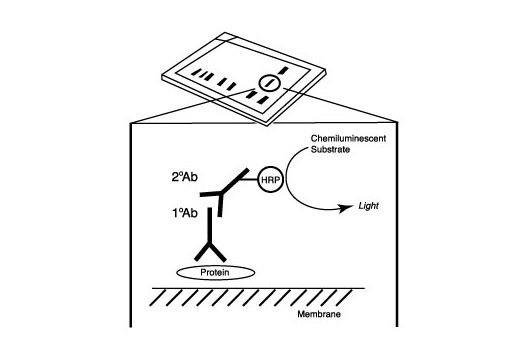 The kit contains enough primary antibodies to perform at least two western blot experiments per antibody. 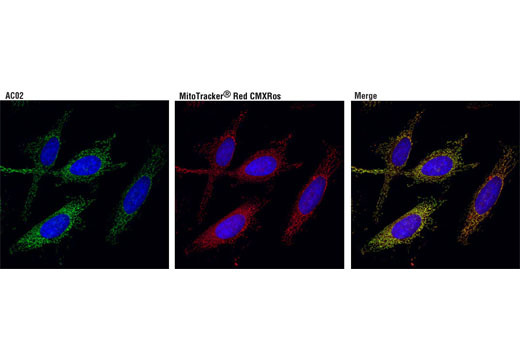 Each antibody in this kit recognizes endogenous levels of its specific target protein. IDH1 (D2H1) Rabbit mAb does not recognize endogenous IDH2 protein, but does recognize IDH2 when recombinantly overexpressed. IDH2 (D8E3B) Rabbit mAb does not cross-react with IDH1 protein. 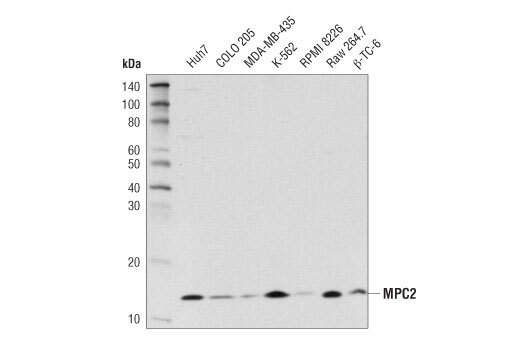 MPC1 (D2L9I) Rabbit mAb does not cross-react with MPC2 protein. 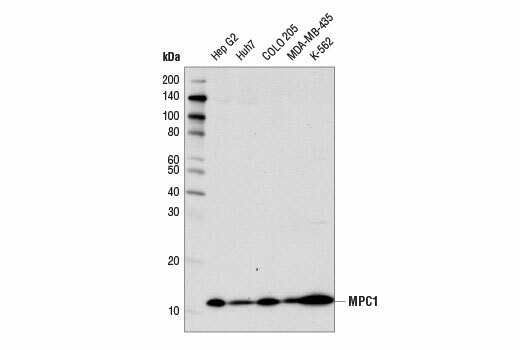 MPC2 (D4I7G) Rabbit mAb does not cross-react with MPC1 protein. Monoclonal antibodies are produced by immunizing animals with a synthetic peptide corresponding to residues surrounding Gly540 of human ACO2 protein, residues near the carboxy terminus of human citrate synthase protein, residues surrounding Pro188 of human DLST protein, residues surrounding Gly354 of human fumarase protein, residues surrounding Arg222 of human IDH1 protein, residues surrounding Val195 of human IDH2 protein, residues near the carboxy terminus of human MPC1 protein, residues surrounding Asn33 of human MPC2 protein and residues surrounding Gly166 of human SDHA protein, respectively. The tricarboxylic acid (TCA) cycle includes various enzymatic reactions that constitute a key part of cellular aerobic respiration. The transport of the glycolytic end product pyruvate into mitochondria and the decarboxylation of pyruvate in the TCA cycle generate energy through oxidative phosphorylation under aerobic conditions (1,2). Two inner mitochondrial membrane proteins, mitochondrial pyruvate carrier 1 (MPC1) and mitochondrial pyruvate carrier 2 (MPC2), form a 150 kDa complex and are essential proteins in the facilitated transport of pyruvate into mitochondria (1,2). Citrate synthase catalyzes the first and rate-limiting reaction of the TCA cycle (3). Mitochondrial aconitase 2 (ACO2) catalyzes the conversion of citrate to isocitrate via cis-aconitate (4). IDH1 and IDH2 are two of the three isocitrate dehydrogenases that catalyze oxidative decarboxylation of isocitrate to α-ketoglutarate (α-KG) (5). IDH1 functions as a tumor suppressor in the cytoplasm and peroxisomes, whereas IDH2 is in mitochondria and is involved in the TCA cycle (5). Mutations in IDH2 have also been identified in malignant gliomas (6). Dihydrolipoamide succinyltransferase (DLST) is a subunit of the α-ketoglutarate dehydrogenase complex, a key enzymatic complex in the TCA cycle (7). Succinate dehydrogenase subunit A (SDHA) is a component of the TCA cycle and the electron transport chain and is involved in the oxidation of succinate (8). Fumarase catalyzes the conversion of fumarate to malate (9). Fumarase deficiency leads to the accumulation of fumarate, an oncometabolite that has been shown to promote epithelial-to-mesenchymal-transition (EMT), a developmental process that has been implicated in oncogenesis (10). Herzig, S. et al. (2012) Science 337, 93-6. Bricker, D.K. et al. (2012) Science 337, 96-100. Lin, C.C. et al. (2012) Sci Rep 2, 785. Tohyama, S. et al. (2016) Cell Metab 23, 663-74. Zhao, S. et al. (2009) Science 324, 261-5. Yan, H. et al. (2009) N Engl J Med 360, 765-73. Diaz-Muñoz, M.D. et al. (2015) Nat Immunol 16, 415-25. Renkema, G.H. et al. (2015) Eur J Hum Genet 23, 202-9. Wang, T. et al. (2017) Nat Cell Biol 19, 833-843. Sciacovelli, M. et al. (2016) Nature 537, 544-547.